Bonus / Graduate activity. 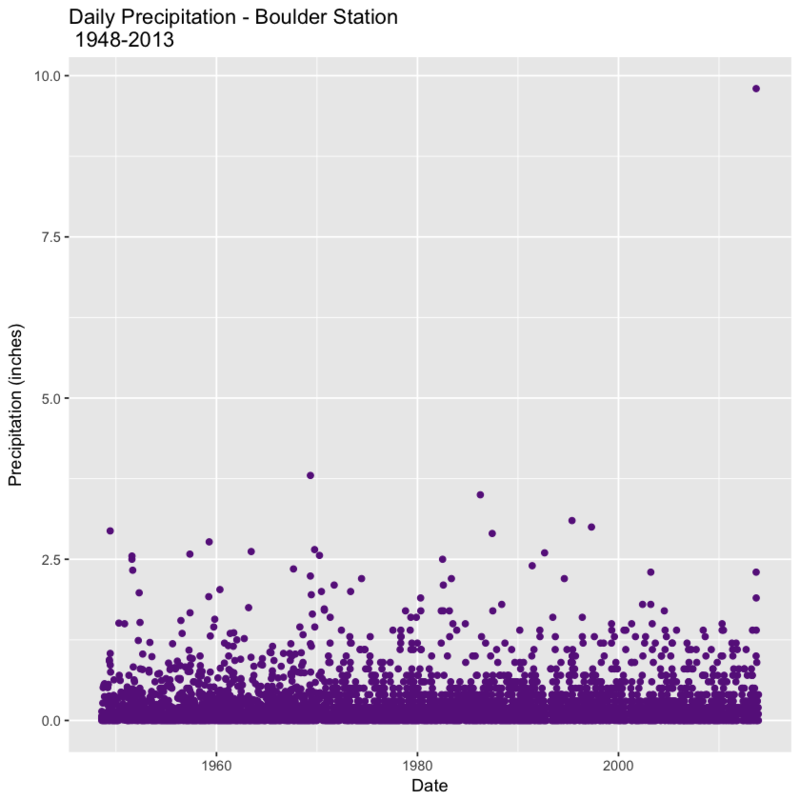 In this lesson, you will plot precipitation data in R. However, these data were collected over several decades and sometimes there are multiple data points per day. The data are also not cleaned. You will find heading names that may not be meaningful, and other issues with the data. This lesson shows you what the plots should look like but does not provide each and every step that you need to process the data. You have the skills that you need from the other lessons covered this week! Aggregate data by a day in R.
View names and rename columns in a data.frame. Please be sure you have the most current version of R and, preferably, RStudio to write your code. R skill level: Intermediate - To succeed in this tutorial, you will need to have basic knowledge for use of the R software program. If you haven’t already downloaded this data (from the previous lesson), do so now. To get started, load the ggplot2 and dplyr libraries, set up your working directory and set stringsAsFactors to FALSE using options(). 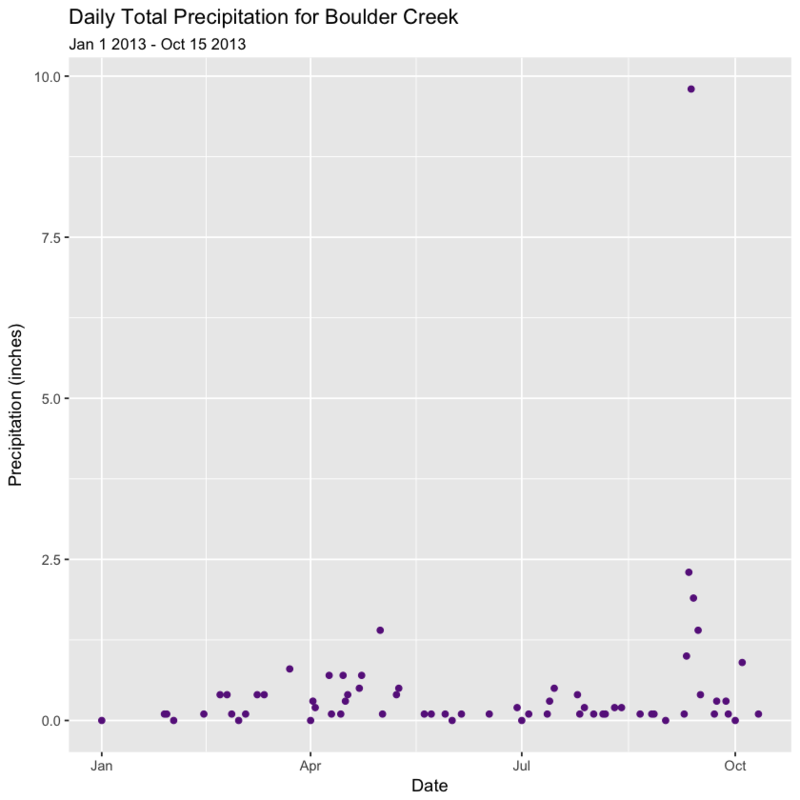 You will use the 805333-precip-daily-1948-2013.csv dataset for this assignment. in this analysis. 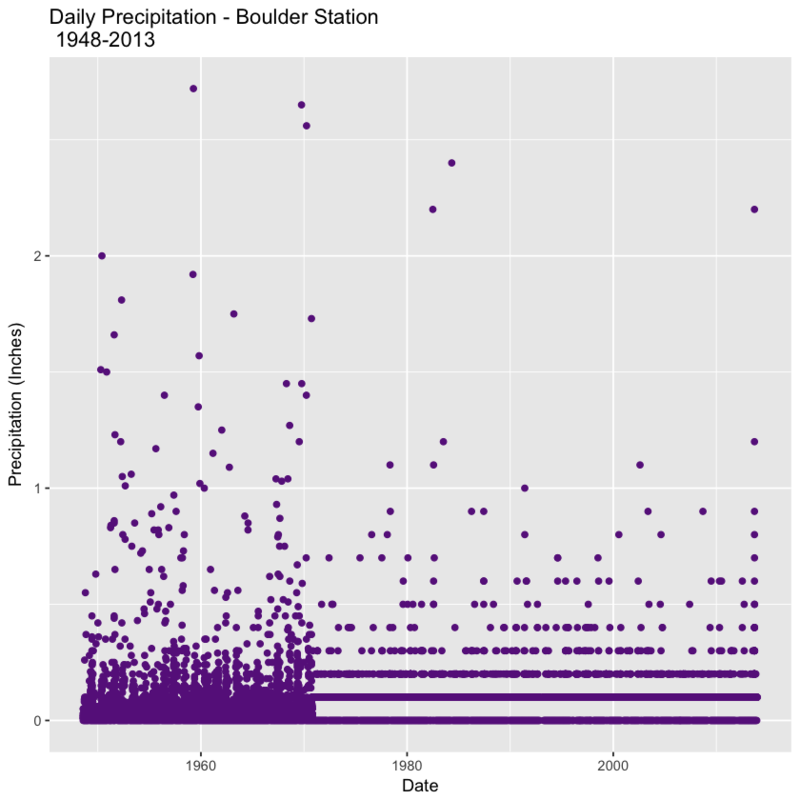 This dataset contains the precipitation values collected daily from the COOP station 050843 in Boulder, CO for 1 January 2003 through 31 December 2013. Import the data into R and then view the data structure. # be sure to handle NA values! The structure of the data are similar to what you saw in previous lessons. HPCP is the total precipitation given in inches, recorded for the hour ending at the time specified by DATE. There is a designated missing data value of 999.99. Note that hours with no precipitation are not recorded. The metadata for this file is located in your week_02 directory: PRECIP_HLY_documentation.pdf file that can be downloaded along with the data. (Note: as of Sept. 2016, there is a mismatch in the data downloaded and the documentation. The differences are in the units and missing data value: inches/999.99 (standard) or millimeters/25399.75 (metric)). Next, check out the data. Are there no data values? If so, make sure to adjust your data import code above to account for no data values. Then determine how many no data values you have in your dataset. View histogram without the 999 NA values! Next, let’s see how many NA values are in your data. 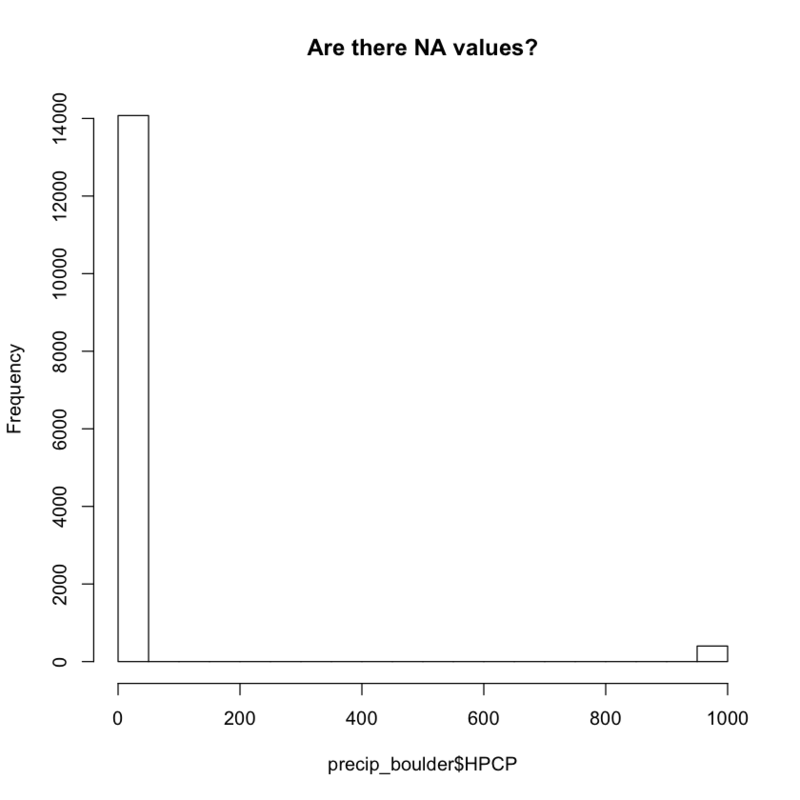 ##  "how many NA values are there?" Next, let’s have a look at the data. Plot it using ggplot(). Format the plot using the colors, labels, etc. that are most clear and look the best. Your plot colors and labels doesn’t need to be exactly like the one below! Note the code is hidden as you should know how to create a ggplot plot now! Any ideas what might be causing the notable difference in the plotted data through time? If you can answer this you can get a bonus point for the week! 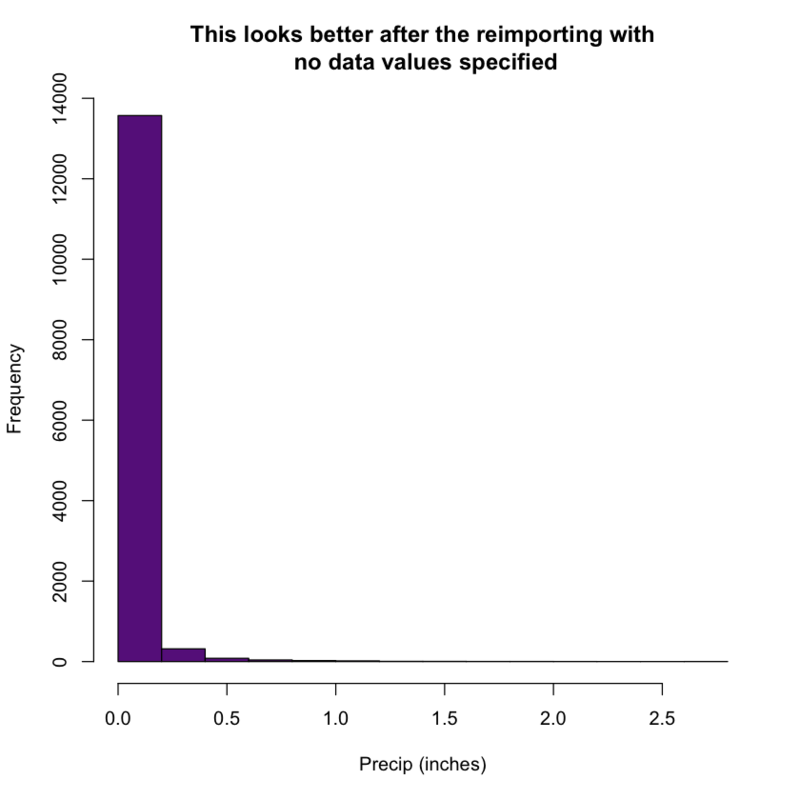 Aggregate the precipitation totals (sum) by day. Subset the data for 30 years (you learned how to do this in a previous lesson). To summarize data by a particular variable or time period, you first create a new column in your dataset called day. Next, take all of the values (in this case precipitation measured each hour) for each day and add them using the sum() function. You can do all of this efficiently using dplyr mutate() function. You use the mutate() function to add a new column called day to a new data.frame c alled daily_sum_precip. Note that you used as.Date() to just grab the dates rather than dates and times which are stored in the POSIX format. ##  "1948-08-01" "1948-08-02" "1948-08-03" "1948-08-03" "1948-08-03"
Next you summarize() the precipitation column (total_precip) - grouped by day. What this means is that you ADD UP all of the values for each day to get a grand total amount of precipitation each day. # how large is the resulting data frame? Now plot the daily data. 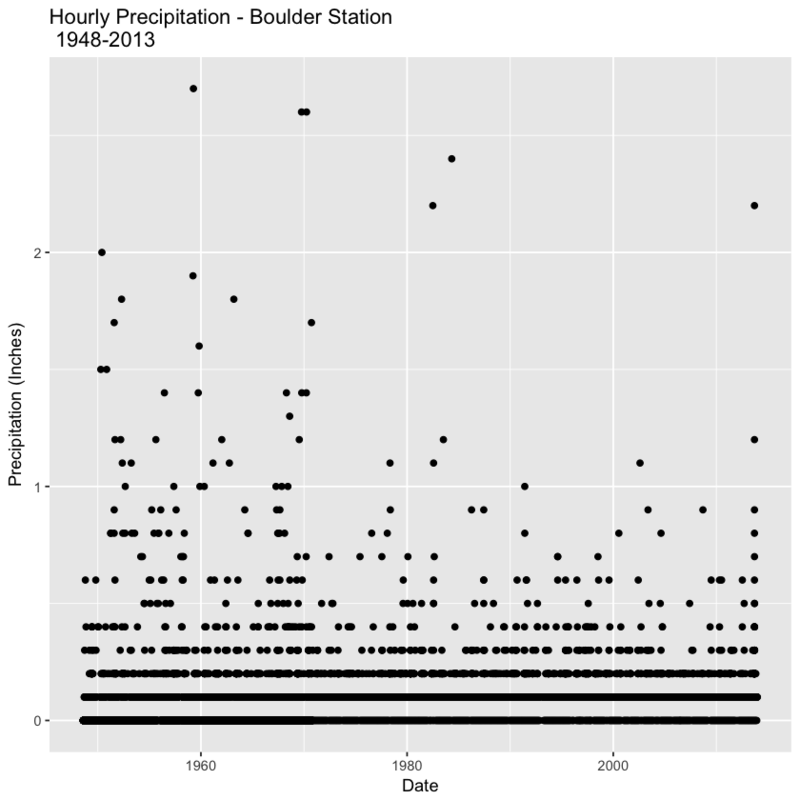 Finally, plot a temporal subset of the data from Jan-October 2013. You learned how to do this in the previous lessons. Now you can easily see the dramatic rainfall event in mid-September! R tip: If you are using a date-time class, instead of just a date class, you need to use scale_x_datetime(). If you wanted to, you could subset this data set using the same code that you used previously to subset! An example of the subsetted plot is below.